This is not an ad for Index Card. I get no commission from this. It’s just that as of this writing (12 February 2014) there is no other way to export your structure from a Scrivener project, work on the structure, and update the Scrivener project with the altered structure. To use Index Card, first buy it from the App Store ($4.99) and install it. Then link it to your DropBox account. In your Scrivener project, follow the directions in the manual for setting up Index Card Sync. You’ll need to set up a collection containing the documents in your project that you want to sync. Give the collection you intend to sync a short name (I use “IC”). Since your Index Card file will have both the name of your project and that of the collection in its filename, keeping the collection name short will help you see the whole name when you view the filename in lists. None of your nested folder structure will make it to Index Card. If you use folders within your manuscript, I find it helpful to sync them to Index Card anyway. I put a tag in the synopsis of each folder (a simple “@” character works for me) to let me know in Index Card that the document is in fact a folder. Then, in IndexCard, the “@s” are markers that will break my project into sections and make it easy, for example, to move a scene from Chapter 3 to Chapter 17. Don’t edit the filename in the Save dialog. Scrivener and Index Card may get confused as to where the information belongs. Exit Scrivener or close the project immediately after syncing. This simple discipline will prevent nearly all editing conflicts. Watch the DropBox icon on your menu bar. Wait until the icon shows a green checkmark before proceeding! There are two ways to open your project in Index Card. The first is to open your DropBox app on your iOS device, and select the .indexcard file in /Dropbox/IndexCard. The use DropBox’s Open In… feature to open the project in Index Card. Or, you can open Index Card, tap the Projects button, tap the DropBox icon, then select your project. In either case, if you get an alert saying that the project already exists, just tap Replace. Open DropBox and mark the IndexCard file as a favorite. Marking a favorite file is permanent, and DropBox will always try to keep the file up to date on your device. If you forget to open your project in Index Card, and you want to start working during your hour-long subway ride, marking it as favorite may save your bacon. Open the project in Index Card on your iOS device before you leave on your journey to wherever. DropBox favorite status is not as reliable as might be hoped. Once you get your project into Index Card, what to do? The good things about Index Card are the corkboard, where you can look at and work with your overall structure, and the card editor, in which you can not only write the text for a scene, but you can also swipe to the next scene (or previous one) to work on that, or for reference before you swipe back to the card you’re working on. If I have a few scenes that are my day’s target, I can get right to work, or I can go to the corkboard to arrange and re-arrange scene order. Turn on the “Long Text Field” option in Index Card’s settings. 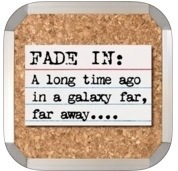 This will let you edit the main text of your scene as well as its synopsis and notes. Don’t bother with stacks. Seriously, don’t. None of the Index Card stack structure will make it back into Scrivener, and the next time you sync to Scrivener and back to Index Card it will all be lost. I will occasionally tag chapter headers with a color (easier than looking for my little “@” characters) if I’m going to be working in Index Card a long time without syncing up. But that will be lost, too, so I seldom bother.